The Alabama hills are a series of rock formations scattered across the east side of central California. These low range rocks have rounded edges and are contrasted by sharp ridges of the Sierra Nevada Mountain Range to the west. Alabama Hills California is located on Bureau of Land Management (BLM) territory leaving it open to the public for free hiking, climbing, mountain biking, 4-wheeling and camping across the area. This is an adventure travelers playground with limited restrictions and spectacular scenery. Where Are The Alabama Hills? 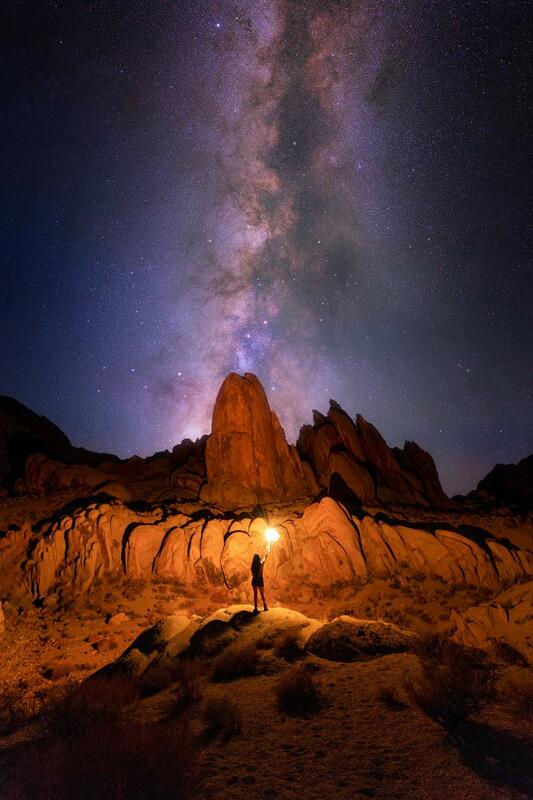 Located just west of Lone Pine, CA the Alabama Hills are situated at the base of the Sierra Nevada Mountains. It is 3.5 hours away from Los Angeles or 4 hours away from Las Vegas. There are no roads leading directly from the west side so you either have to come from the North, South, or through Death Valley in the East. Surrounding the Alabama Hills are a variety of popular National Parks including Death Valley, Sequoia, and King’s Canyon. Once you get into the Alabama Hills, all roads are dirt. They are fairly well maintained a suitable for RVs and 5th wheel travel trailers. You won’t find any amenities in the hills. The closest gas station and services are in Lone Pine, about 5 miles away. When it comes to activities in the Alabama Hills, the possibilities are endless. Hiking, photography and rock climbing are among some of the most popular activities. Mountain biking, horseback riding, and 4-wheeling are other things to do. On this swath of BLM land resting beneath Mt. Whitney, your imagination is the limit. There are no potable water, amenities, or other services. You can wander off into the rocky dessert and explore the area on your own. Hundreds of rock Arches dot the landscape making it a fun place to go arch hunting or take photos with the stars above. The most famous rock formation there is Mobius Arch. It’s a short 0.25 mile walk from the Y-end of Movie Road. The arch stands over 8 feet tall and frames Mt. Whitney Behind it. Because of all the nooks, crannies and unmarked hills the area is popular for Geocaching. Some are located right next to the arches and others are quite a bit harder to find. The desolate location and unique features of Alabama Hills has made it the star of many popular Hollywood Movie sets. At the Lone Pine Chamber of Commerce you can grab a map of Movie Set locations and take a hike or drive through the filming locations on Movie Road. Over 50 Hollywood movies have been shot there including Iron Man (2008), Gladiator (2000), Django Unchained (2012), Firefly (2002-2003), Man of Steel (2013), A Star is Born (1937), Adventures of Captain Marvel (1941), and countless others. Ease of access and user friendly routes makes it a popular place for climbers. There are over 300 sport climbing routes many of which are easy to moderate making it a good place for beginners and those doing trad climbing. The climbing routes are short hikes from the main roads. Many climbers find this area a popular alternative to Joshua Tree National Park. While you can mountain bike anywhere, there are fun single track descents and loops blanketing the area. Trails in the Alabama Hills can get sandy making some routes technical, but there are plenty of easy paths to take as well. There are certainly a number of sights and rock formations to enjoy along the way. The distance between these would be more difficult to get to on foot. Follow in the Footsteps of John Wayne and explore the Alabama Hills by horseback. On the National Recreation area you can bring your own horse or join one of the many riding tours in Lone Pine. Trail rides can take you past the rocky hills into the forested trails and creeks to the west. Big boulders make the Alabama hills a popular destination for off-roading. Some of the most scenic campgrounds are off the main roads further west towards the Sierra Nevada Mountain Range. You can drive past abandoned mines and undiscovered caves to get there. The best time to take photos in the hills is of course, during the golden hour. That’s the hour shortly after sunrise or just before sunset. Additionally, the night sky in that area of California gets very dark so you’re likely to see a lot of stars. If you’re looking for Instagram pictures, drive north on movie road past the Eye of Alabama Hills Arch. The road will curve to the left then dip downward sharply. This a popular spot for photographers to show the depth of the mountains beyond the road. Camping in the Alabama Hills is completely free. Situated on BLM land, there are no outhouses, potable water or waste receptacles. The whole area is a ‘pack it in pack it out’ location. If you’re looking for something with more amenities, the campgrounds nearby have bathrooms and in some cases electricity. There are multiple fire rings scattered throughout the hills and it’s recommended that you use those primitive campgrounds when staying overnight to preserve the surroundings. Pets are allowed throughout the entirety of the area. The city just asks that you pack out all trash, travel on existing roads and preserve the vegetation. The Bureau of Land Management operates three campgrounds near Alabama Hills: Lone Pine, Tuttle Creek and Portagee Joe. All of them are dry camping sites. While there are some amenities, none of them have showers. There are showers available at the Portal Store in Lone Pine. 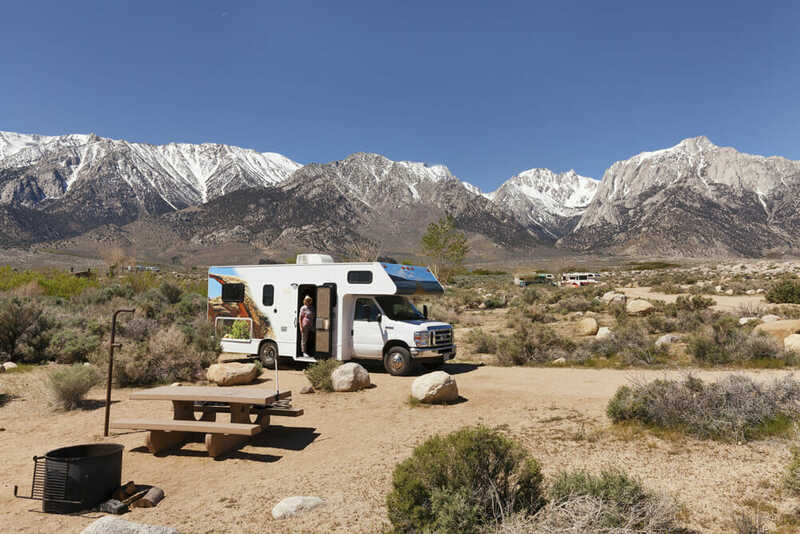 Lone Pine is the most popular campsite for RV travelers. It is 6 miles west from Lone Pine, California. There are both electric and non-electric campsites and it’s closed in winter. There are only a few tent sites in Lone Pine. RV and trailer sites take up the majority of the campground. Reservations are accepted, but there are walk-in sites available as well. You’ll find the most tent camping sites at Tuttle Creek Campground. They have 83 sites open year round, though the water spigots are closed October – March. This is the least expensive campground in the area and comes with your standard dry camping amenities: vault toilets, fire rings, and picnic tables and lantern holders. No reservations are accepted ahead of time. There is an RV dump station for $5 and two horse corrals that can be rented for $10 per night as well. Portagee Joe is the smallest campground in the area with just 20 sites. They are RV friendly under 30 feet and have a mix of RV and tent camping spots. Like the others, there are vault toilets, water spigots, fire rings and picnic tables. They do accept reservations up to 9 months in advance, but they do not have any electric campsites. This campground is located 4 miles south of Lone Pine on Diaz Lake. They have both electric and non-electric sites as well as a swimming area, a dock to take your boat out for some fishing and water hookups. This is a dry camping site with no showers and vault toilets. It’s closed in the winter and reservations are accepted through Reserve America. Temperatures can reach 100 degrees in the heat of July and dips down to the mid-40s in the winter. The area does get crowded on the weekends making climbing difficult, especially in the summer months. If you want to get the place to yourself, we recommend visiting in the winter or going early in the day. Visiting the Alabama Hills is a day trip in itself. But if you’re out on a longer road trip, there is plenty to see in the surrounding areas. Death Valley National Park is only an hour away. Mammoth Lakes is less than 2 hours North. And if you want to hike part of Mt. Whitney, one of the main trails begins just 10 miles west of the hills.